Side-by-side: the Lorenz SZ42 used in Germany-occupied territories and the reconstructed Tunny machine that decrypted the messages at Bletchley. 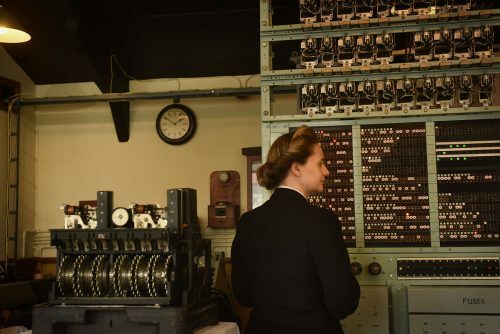 For the first time ever, all the equipment used in making and breaking Lorenz, Hitler’s most secret cipher, was demonstrated with re-enactors to an audience including Colossus Wrens (WRNS – Women’s Royal Naval Service) at The National Museum of Computing (TNMOC) on 3 June 2016. The breaking of the top-secret Lorenz messages of German High Command is credited with shortening the war and saving countless lives. Much more complex than Enigma, the Lorenz cipher (called Tunny in Britain) was broken thanks to Bill Tutte’s deduction of the principles of a Lorenz machine without ever having seen it. As a result, the Allies were routinely able to read German High Command’s top secret messages. From 1944, with the creation of the Colossus computer by Tommy Flowers, the Allies were able to reduce the decrypt time from weeks to hours, a speed that effectively undermined the German military machine. Re-enactor taking the wheel settings sheet discovered by Colossus. Intelligence gained from the Breaking of Lorenz was highly significant at several points during the war and especially in the run-up to D-Day on 6 June 1944. By being able to read the communications of the German High Command, it was realised that the deception of where the landings might be had been successful. The Breaking of Lorenz, involving cutting-edge technologies, was so important that it was kept top secret for decades and there was no public mention of Colossus until 1975 and details of the Lorenz (Tunny) story did not emerge until this century. For twenty years, volunteers at TNMOC have researched and worked meticulously to reconstruct the British equipment used in the Breaking of Lorenz from intercept to decrypt. Now, with some recently acquired original equipment, the Museum can demonstrate the other side: how the messages were encrypted and transmitted in German-occupied territories. The newly arrived equipment representing the German operations includes an original Lorenz SZ42 encryption device on long loan from the Norwegian Armed Forces Museum, a 1943 German military teleprinter and a Spruchtafel used to determine the starting positions of the rotors of the Lorenz SZ42 for each message. Five surviving Colossus Wrens, a female Colossus wireman and relatives of key figures in the Breaking of Lorenz were enthralled to see the full ‘end to ends’ re-enactment. 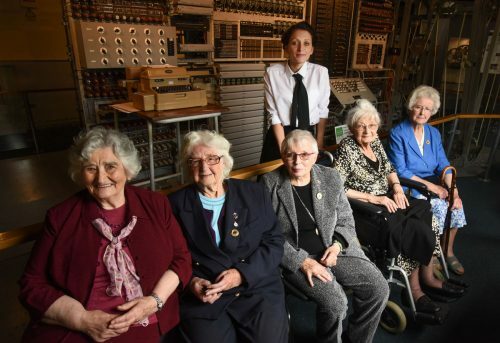 Colossus veterans left to right: Irene Dixon, Lorna Cockayne, Shirley Wheeldon, Joanna Chorley, Margaret Mortimer and standing Jacqui Garrad of TNMOC in front of Colossus Rebuild. Andy Clark, Chairman of TNMOC, said “We believe that never before has all this equipment been seen together and demonstrated under one roof. Thanks to the incredible work of TNMOC volunteers, the full story can now be seen daily by the general public. And it is fitting that the location is Block H, the world’s first purpose built computer centre, the home of Colossus, on Bletchley Park. “For decades this story could not be revealed to the public. Yet, its impact during wartime and post-war society has been huge and resonates to this day. The technologies at the core of the Breaking of Lorenz– encryption, communications and computing – are at the very heart of our modern world, so the narrative is as relevant today as it was then and an inspiration to the next generation of computer scientists and engineers. 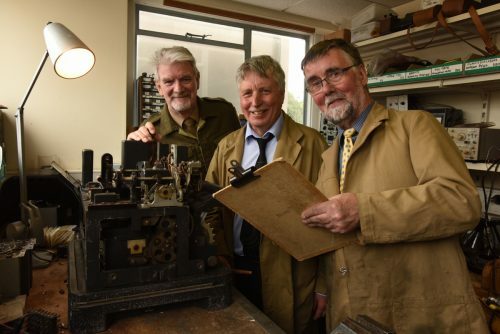 TNMOC volunteers John Watson, John Pether and Charles Coultas who were part of the team responsible for the reconstructions and restorations in the workshop with the Lorenz SZ42.